Hotel's Cherry Hill, New Jersey Location Near PhiladelphiaAmong area hotels, the Holiday Inn Philadelphia - Cherry Hill, NJ hotel rises above the competition to provide comfortable accommodations and a superior location. 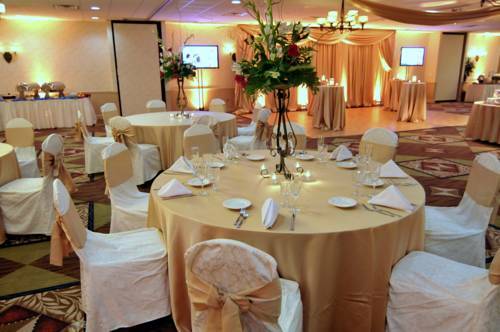 Situated six miles from the Center City Philadelphia area, our hotel is in the "Heart of Southern New Jersey" and just 18 miles from Philadelphia International Airport (PHL).Our professional services and flexible event space for 350 guests make us the best choice for weddings, social events, conferences, and corporate meetings in Cherry Hill, NJ area. Hotel guests prefer our location near Campbells Soup, Rutgers University, and Cooper Hospital, as well as the 24-hour Business Center and free wireless Internet access throughout the hotel.Cherry Hill, New Jersey is minutes to the Camden Waterfront, home of the USS New Jersey. The Market Place at Garden State Park has shopping and dining directly across the street. Guests are also within minutes of the Cooper River Park, Pennsylvania Convention Center, Wells Fargo Center, BB&T Pavilion (formerly Susquehanna Bank Center), Lincoln Financial Field, Citizens Ballpark, and Sahara Sams Oasis Waterpark.From the award-winning, Red Hot & Blue Restaurant featuring live Blues nights, free parking, 24-hour Fitness Center and our indoor and seasonal outdoor pools, our hotel has something to satisfy every guest. The Promenade at SagemoreResturation Hardware, The Gap, Trader Joe's ,Guess, White/Black, Loft, Ann Taylor, P.F. Chang's, LL Bean, Harry & David's,Apple Store and many other Stores located on Rt 73.